Mnuchin was a member of Sears’ board from 2005 to 2016, and was previously a member of Kmart’s board before it was bought by Sears. Treasury Secretary Steven Mnuchin was for more than 10 years a member of the board at Sears, a company President Donald Trump described it as being “improperly run” after it filed for bankruptcy. “It’s been obviously improperly run for many years and it’s a shame,” he said. 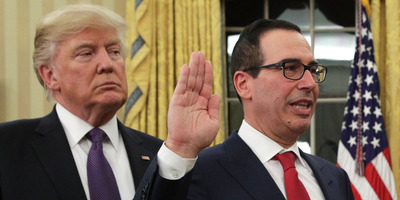 Mnuchin, who joined Trump’s campaign team in 2016 and was confirmed as Secretary of the Treasury in February 2017, was a member of Sears’s board from 2005 until December 2016, Bloomberg reported. Trump did not specify a time period for Sears being run “improperly”, but Mnuchin’s involvement spans much of the decline which preceded its filing for bankruptcy. Mnuchin was a college roommate of Sears Chairman Eddie Lampert, who attended Mnuchin’s confirmation hearing for Treasury secretary in January 2017, according to Bloomberg.